Getting married under the Zodiac sign of LIBRA? Libra is the sign that rules marriage. This is probably why October is one of the biggest wedding months. 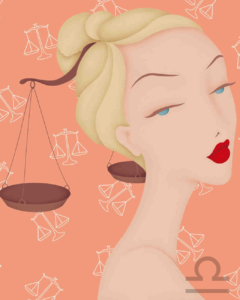 Libra marriages are, not surprisingly, very much about balance and give and take from both partners. The relationship is a real priority to you and your man. However, the danger lies in losing your individuality. Remember to break out of the couple bubble and do things on your own too.